Cryptanthus (crip-TAN-thus) means "Hidden Flowers" and was named by a German... Mr. Klotzch in the 1830's. This Bromeliad is native to Brazil with about one hundred species. It is a terrestrial bromeliad, meaning it grows on the ground. They do not like a regular potting mix, instead... they prefer spagnum moss and lots of water. Because of their shape and markings, they have been nicknamed "Earth Stars" and "Lizard Plants." Their size is small to medium with a span of 12 inches or less. They grow close to the ground with heights lower than six inches. The colors range from browns... black... gray... green... purples... pinks... reds... silver... variegated and albomarginata. Markings are bands... zig-zags... bars... stripes... and mottling. The offsets (pups) are produced by basil offsets... between the leaves and underground stolons. The flowers (usually small and white) are not the objects for attention of this species... it is their very unusal shape and foliage that is the attraction of this plant family. This is the only family that has its own society... the "Cryptanthus Society." About 2500 to 3000 footcandles of light is best, which translates to 55% to 75% shade cloth in sunny locations. With too little light, foliage color and their strrong markings fail to develop. At the other extreme, too much light bleaches their foliage colors. They do extremly well on patios where the area is lit by morning or afternoon sun, but not directly on the plants. The colors change with the seasons and the amount of light they receive. Cryptanthus tolerate a temperature range from 40 degrees F. to over 100 degrees F.
Optimum growth occurs between 60 to 85 degrees F.
Follow basic bromeliad culture. Cryptanthus prefer at least moderate humidity levels and perform best when grown on or near the ground among ferns or begonias, or close to ponds. Keep the medium moist at all times, they suffer if left to dry out for extended periods of time. Cryptanthus are true terrestrials, they do not absorb water or nutrients through their leaves. They develop a strong root system and are not suitable for mounting. They prefer a more water-retentive potting medium than most of the other bromeliads but it still must drain rapidly. Do not under-pot, at least a five or six inch pot is best and use a loose, porous medium rich in peat moss and/or other organic materials. They respond well to generous fertilizing. Most growers recommend adding a slow-release fertilizer to the potting mix and feeding with liquid fertilizer on a regular basis during their active growing period. Offsets of some cultivars may be a little relucant to establish themselves. Propagate in spring or summer. It helps to remove the dry, rudimentary leaves at the base of the pup in order to expose the tiny root buds. At first glance, it would seem that Bromeliads and carnivorous plants have little in common. They not only don't look much alike, but most bromeliads grow in trees while the majority of carnivorous plants are denizens of swamps, bogs, fens and other wet sites... However, both types of habitat present plants growing in them with the same problem... a lack of nutrients available to the plants roots. 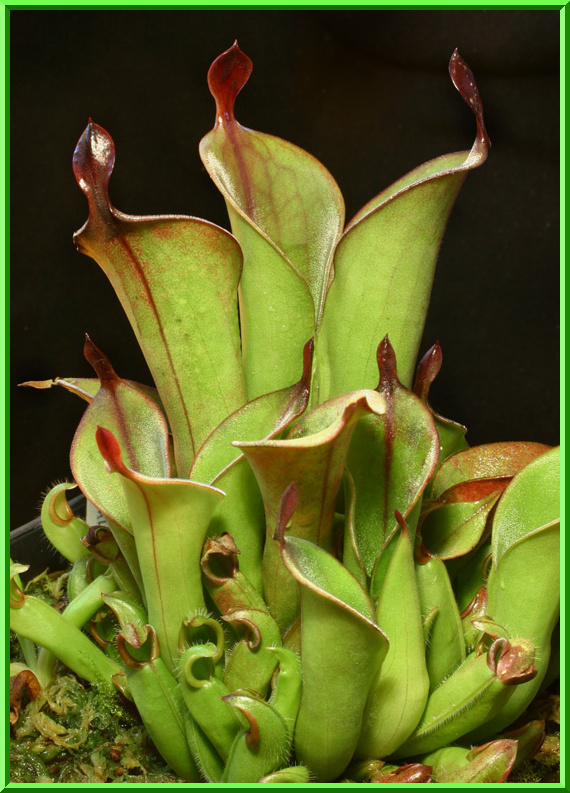 Both bromeliads and carnivorous plants have responded by adapting their foliage into their main nutrient gathering structures instead of their roots. It's just that one group became carnivorous in the process and the other largely bacame vegetarian. To be regarded as carnivorous, a plant must be able to accomplish three things: attract prey; be able to absorb the resulting nutrients. Some would add a third requirement, that of actually producing digestive enzymes (proteases). That requirement would eliminate some obviously carnivorous species that instead depend upon bacterial and fungal action to break the prey down to substances they can absorb instead of producing their own proteases. Therefore, there is not universal agreement as to what consitutes a carnivorous plant but, Carnivory has been attributed to more than 550 species of plants in nine families and 17 genera (Cheers 1992). The methods of attraction, capture and nutrient absorpation differ widely. 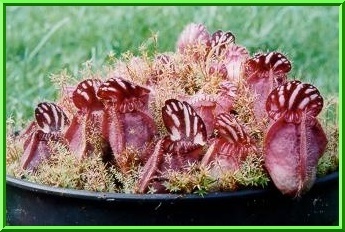 The foliage of some, such as the genera Utricularia, Aldovandra and the famous Dionaea, or Venus Flytrap, have evolved into active trapping mechanisms, while others such as Cephalotus, Heliamphora, Sarracenia and Nepenthes, have developed water-holding structures from their leaves that are passive in nature but are equally effective at trapping prey. Insects are lured downward to their fate by strategically placed nactar glands. Once inside the pitchers, escape is prevented by a combination of downward facing hairs that allow movement in one direction only. Waxy slipprey sides inside the pitchers do not allow a foothold of the prey to climb out, or translucent false exits that prey continually crash into while trying to fly out. Tank-type bromeliads operate in much the same way, except that the resulting soup is mostly vegetable instead of bug broth. The wide-spreading rosettes of tank-type bromeliads are efficient mechanisms for gathering both water and falling debris, mostly of a vegetative nature. If you look down into a bromeliad rosette, it is obvious that everything falling within the circumference of the circle formed by the rosette of leaves is collected and carried down to the base of the leaves. Actually, bromeliads could be said to be omnivores instead of vegetarians. While the cups are usually filled with decaying vegetation, the water is also home to a wide variety of aquatic life that pay rent to their host plant in the form of their easte products. That, along with bird droppings and a occasional accidental drowning of an insect that had blundered into the water, all become ingredients for the soup. *Both are evolutionary products of nutrient poor environments. *In both groups, the foliage has been specifically adapted for gathering nutrients and is equipped with specialized cells to absorb them. *Both contain phytotelmata plants. Phytotelmata plants are those that hold water. They are importatnt aquatic ecosystems for a variety of life. There are species of mosquitoes that breed in the cups of bromeliads and other species that breed in the pitchers of such carnivorous plants such as Nepenthes and Sarracenia. *A variety of small animals, everything from protozoa to crabs and frogs depend on their resrvoirs of both types of plants for at least a portion of their life cycle. Some species of frogs are known only to breed in bromeliads. It is not suprising that in providing aquatic habitats high in the tree canopy, the bromeliad biota is extensive. More suprising is the existance of a number of creatures able to withstand the highly acidic content of the pitchers of some of the carnivorous plants. For example, at least 150 creatures are known to depend upon Nepenthes for part of their life cycle. (D'Amato 1998). *Some species of both groups bring a mini-aquatic environment up into the trees. Many bromeliads do this, but so do members of the carnivorous genus Nepenthes. *At least one carnivorous species, Utriculatia nelumbifolia, has so far been found only in bromeliads. *Three bromeliad species sre regarded by many as carnivorous plants. They are Catopsis berteroniana, Brocchinia deructa, and Brocchinia hechitoides. In 1976, a researcher examining materials found in various south Florida bromeliad tanks noticed that Catopsis berteroniana always seemed to have an unusual number of nin-aquatic insect corpses in its leaf bases. Subsequent experiments proved that Catopsis berteroniana consistently contained many times more non-aquatic insect victims than other bromeliads of comparable size. The areas above the water-filled leaf bases are heavily coated wit a powdery substance that would hinder the insect from escaping once they've fallen into the tank, and it is theorized but not yet proven, that the foliage reflects UV light in such a way as to confuse insects and cause them to fly into them and tumble into the tank. In 1984, a second bromeliad, Brocchinia reducta from Venezuela and Guiana also came under suspicion of being carnivorous. It is surprising that this plant wasn't regarded as a potential carnivore before then. 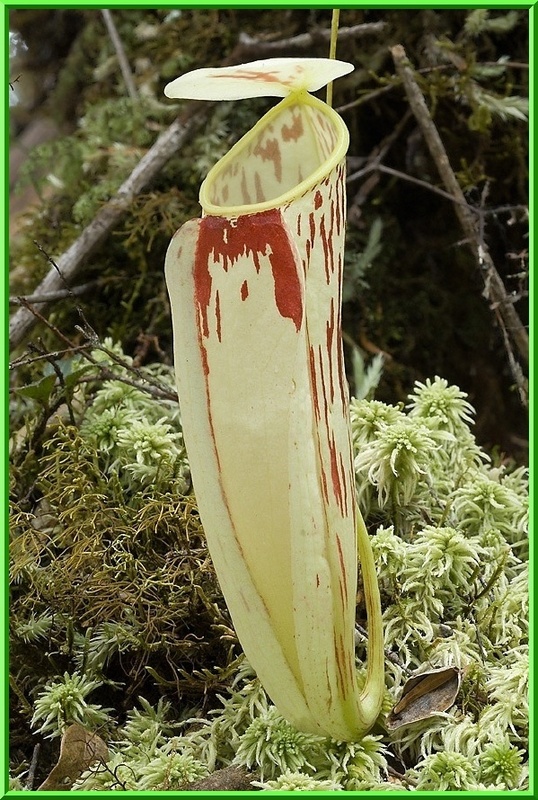 With its tall tubular structure and tank of highly acidic water, it looks like a carnivorous plant and grows among plants from the genus Heliamphora in wet, nutrient poor soils on the tepuis of Venezuela. They grow in open exposed areas where access to vegetative debris is minimal. The primary food of Brocchina reducta and its close relative, Brocchina hechtioides appears to be ants. Catopsis and Brocchina do not produce digestive enzymes themselves but instead rely on their bacterial and fungal symbionts to reduce their prey to substances that can be absorbed by the plants trichomes. It can be argued that as long as this process works so well for the plant, there is no need to expend energy in developing digestive enzymes, but the lack of enzyme production is the point of contention as to whether the plants should be regarded as carnivorous or not. Bromeliaceae: Profile of an Adaptive Radiation. A Guide to Carnivorous Plants of the World.